“You have been believers so long now that you ought to be teaching others.” (Heb. 5:12a) Apostle Paul. There are many ways of teaching. But today’s message is about the second part of our formula, our “Inner Circle”. As you can see, my “God Task” kept me pretty busy and on track this week, as it normally does. 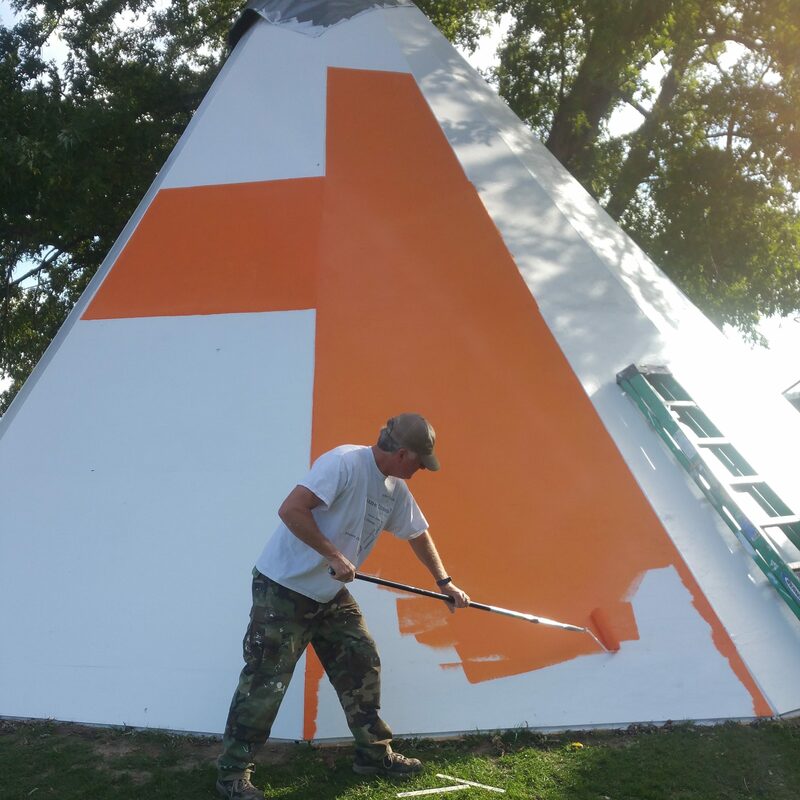 Painting that whole Teepee is no small job. But in the midst of all that, what about people? That building is not a person. It has no soul. It has no eternity, but will burn up or rot away one day. Jesus is all about people! So if my God Task does not also include influencing people towards the Kingdom of God, then it is probably not a true God Task. It’s a me, mine, and I task. Paul said we ought to reach a point of teaching others. Jesus gave the Great Commission of making “disciples” in all nations. None of us are excluded from these expectations, and it is part of God’s great design for keeping us on track! We all need to examine our personal Inner Circle, and I’m not talking about your circle of friends who “influence you”, I’m talking about those “YOU INFLUENCE”. To narrow it down even further, only those you influence towards Christ! You may have those you are a bad influence on, and you may be pushing them away from Christ, not towards. If so, you need to correct this immediately! Blood on your hands! Do you believe? So…take a little time here. Make some list of your Inner Circles. Jesus had his 70, his 12, and even his 3. He plainly set the example. This is what Jesus DID. Your numbers may be different. That part doesn’t matter. But as you examine your personal Inner Circles, isolate the ones you are actually influencing into the Kingdom of God. We teach in many ways, but whatever your method is, it should be very plain you are a disciple of Christ, and you disciple others in Christ. This is what Jesus calls “Church”! It’s not about a building. It’s about us walking in unity with our Lord. If you’re not discipling in some form, you’re not having Church according to the way Jesus DID. I hope to say more on this before we move to the next part of the Formula. But for now, in order for this Formula to work, you must take time to meditate, study, examine your performance in this area. We are all called to minister in some way to some one, and probably several someones. Who are those you can honestly say before God, I am a teacher unto them. I am a disciple who disciples. Once you realize the magnitude of being a spiritual father or mother to someone, you will also realize the godly balance it will influence in your own living. So work on those lists! This is not a short article. It includes an assignment. I’m keeping the words short so you will hopefully do the assignment. The devil will try to keep you from it. Don’t let him win. It’s not just about YOU. The souls of others hang in the balance. Think about the people who are attached to the names you write down. I do hope there are at least a few names, but if not, then your life is definitely out of balance and mostly about YOU. YOU can change that! Let the only blood on your hands that day be the blood of Jesus! Selah.